For medallions and borders installations, Bostik makes a very convenient glue cartridge. A fast curing, one-part, cartridge/gun applied, Bostik Best moisture cure urethane adhesive that does not contain water or chlorinated solvents, is V.O.C. Compliant and has no ozone depleting chemicals. Read Data Sheet for Bostik Best. Typically one cartridge is sufficient for 30" medallion, two cartridges for 40 " and 48" medallions. 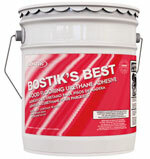 For larger installations, Bostik Best glue is available in two and five gallon cans. Bostik glue is the only adhesive tested and certified by Czar Floors for inlays. Use other adhesives at your own risk. 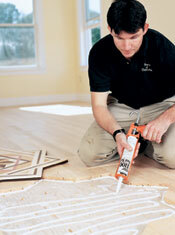 Czar Floors does not provide warranty on subfloor separation for other adhesives. One routing bit is included with every medallion. However it may break during the installation. To avoid delays, you may purchase additional router bits online or add it to your order. The bit is 2 flute, carbide tipped with totally enclosed guides. The top mounted bearing is ideal for template routing. Parquet Adhesive, Bostik Best, 5 Gal. regulations for Volatile Organic Compounds (V.O.C. Compliant). Coverage is about 200 sq.ft per 5 Gallon drum for 3/4" parquet installation. Parquet Adhesive, Bostik Ultra-Set, 4 Gal. Bostik's Ultra-Set® SingleStep™ is a one-part, trowel applied, tacking, moisture-cure urethane Adhesive, Moisture Vapor and Sound Reduction Membrane. This scientifically-formulated adhesive and membrane is very tenacious, has very low moisture permeability, and is formulated with patent pending Thickness-Control™ Spacer Technology to ensure proper membrane thickness between hardwood flooring and the substrate. Bostik's Ultra-Set SingleStep does NOT contain any water, and has zero VOC as per SCAQMD 1168. This adhesive is a must for direct on concrete installations and highly recommended for any other glue-down installations. 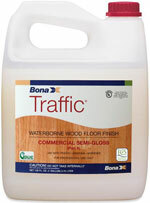 For heavy-traffic commercial and residential hardwood floors, Bona Traffic™ provides the ultimate in durability and beauty, outperforming any finish in the industry- moisture care, solvent-based, oil-modified or other waterborne finishes. Coverage is about 250 sq.ft per Gallon for 3/4" parquet installation. Two coats is sufficient for most applications. Three for critical applications. Bona Amberseal sealer™ is a ground breaking waterborne primer, offering an intense, rich and warm colouration to wooden floors previously achieved only through solvent based formulas. With excellent abradability, low VOC and fast drying time, Bona Prime Amberseal is a natural and safe alternative for the future. Coverage is about 250 sq.ft per Gallon for 3/4" parquet installation. One coat is sufficient for most application. Two for critical applications. 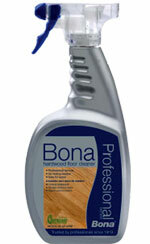 Bona Pro Series Hardwood Floor Cleaner, 32 oz.